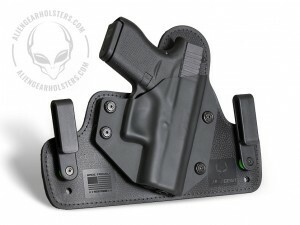 GunLink has reviewed a number of Alien Gear holsters and accessories, including the original Cloak Tuck IWB holster and the updated Cloak Tuck 2.0 model and clip options. Now, their latest offering, the Cloak Tuck 3.0 line of holsters has been honored by the NRA’s American Rifleman editors. American Rifleman has named the Cloak Tuck 3.0 concealed carry holster an Editor’s Choice for IWB holsters. According to Managing Editor Joseph L. Kurtenbach, Alien Gear Holsters has improved on the design of the Cloak Tuck Series after launching their third generation of concealed carry holsters. After testing out the Cloak Tuck 3.0 for two months with several guns, Kurtenbach was impressed by a variety of elements that this inside the waistband holster had to offer. The NRA’s managing editor explained that Alien Gear Holsters has evolved the IWB holster to better suit the needs of concealed carriers. “Alien Gear did not invent the winged IWB handgun holster, but the Idaho-based company’s Cloak Tuck 3.0 has evolved the design in terms of construction, comfort and value,” Kurtenbach said.